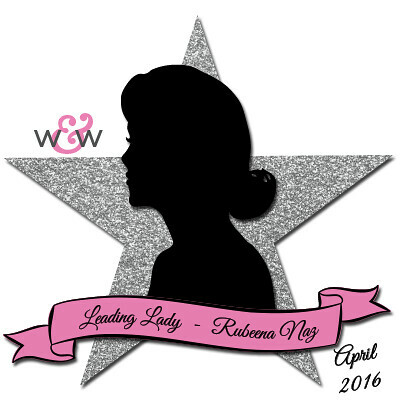 Our April Leading Lady, Rubeena Naz, is back for her fantastic fourth performance! If you missed her smashing debut you must see it...CLICK HERE or her sensational second performance of bright and bold watercolor wonders CLICK HERE or her triumphant third performance of dazzling My Precious projects CLICK HERE! Rubeena is nothing if not fabulous and fashionable and today she will show you how you can be too! And now we present Rubeena! Good morning! I am back with my fourth post as Leading Lady for Winnie & Walter! Thanks so much for all your comments on my last three posts. If you missed them, you can find them here. The cards I share today are inspired by fashion. One of my favorite challenges used to be the Runway Inspired Challenge, which is currently on a hiatus. 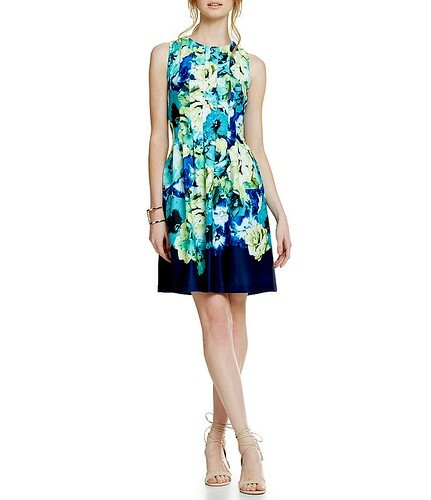 Even before I discovered the challenge, I used to look up photos of dresses for design or color inspiration. I will share a few dresses I found online and the cards that were inspired as a result. To begin, I created a clean and simple card. This is generally not my style, but I am comfortable with it. It is tolerated by the perfectionist in me. 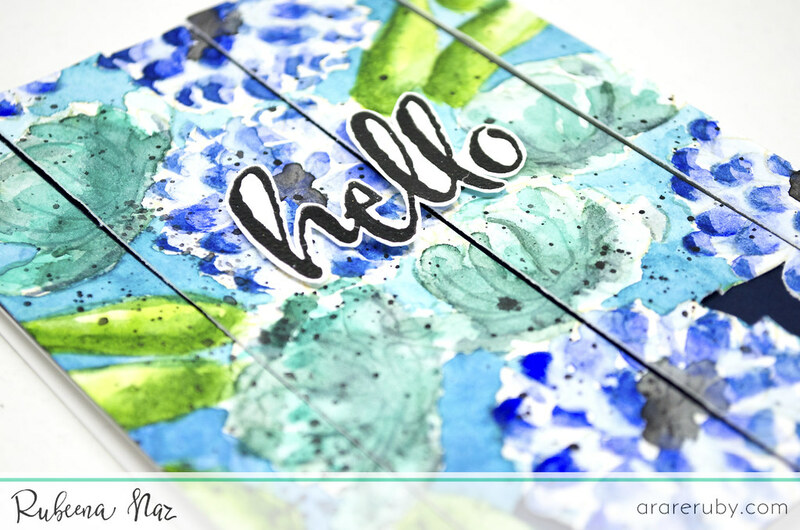 I focused on the color combination of white, blue, and black so I started by stamping the large flower and some ferns from In Bloom: Addie's Garden with a waterproof black ink. I fussy cut the images and colored a few petals. 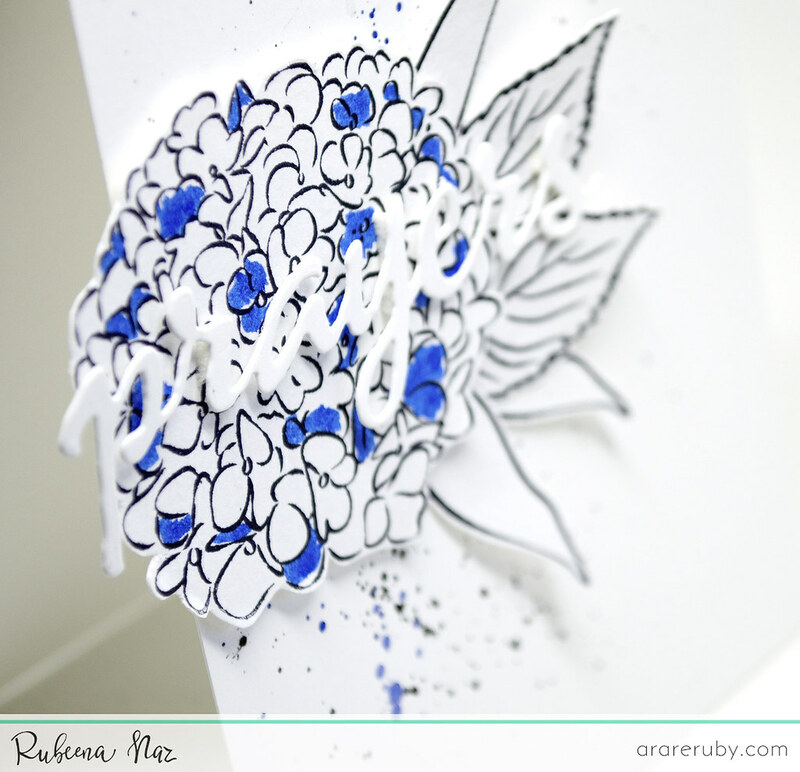 On my A2 white card base, I added some black and blue splatters and arranged the images over it with foam tape. Finally, I fussy cut 'prayers' from The Big, the Bold, and Comfort Cutaways using white card stock and added it over the images with foam tape. For the next card, I focused on a few different elements. I stamped two of the images from In Bloom: Addie's Garden with VersaMark Ink onto watercolor card stock and heat embossed with clear embossing powder. I colored with Mission Gold watercolors. Once it dried, I die-cut the word 'hi' from In a Word: Hi Cutaway from the colored panel. 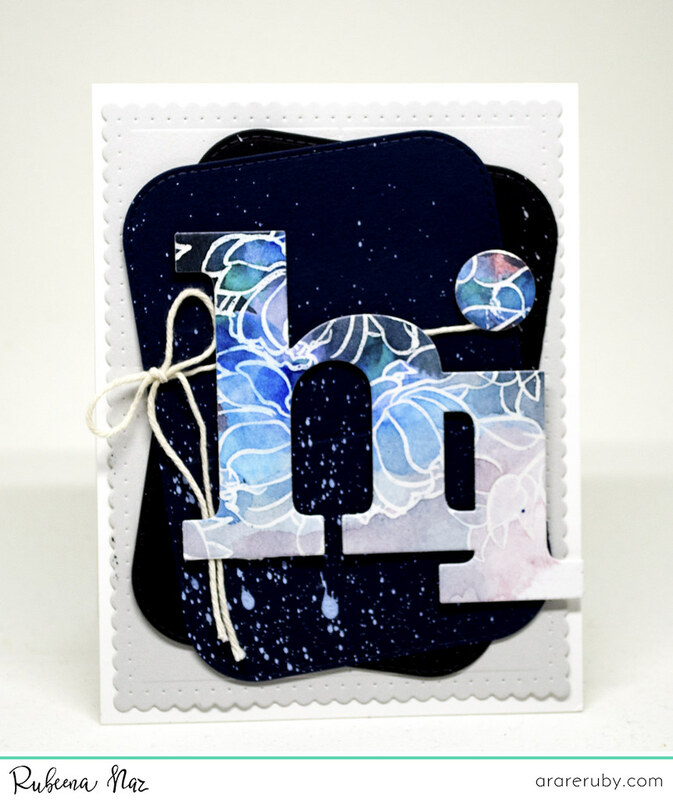 In the dress, the colors blue and gray stand out most so I added them as card stock layers. I die-cut light gray card stock using the large scallop die from Essentials: Audrey Cutaways and glued it to my A2 white card base. 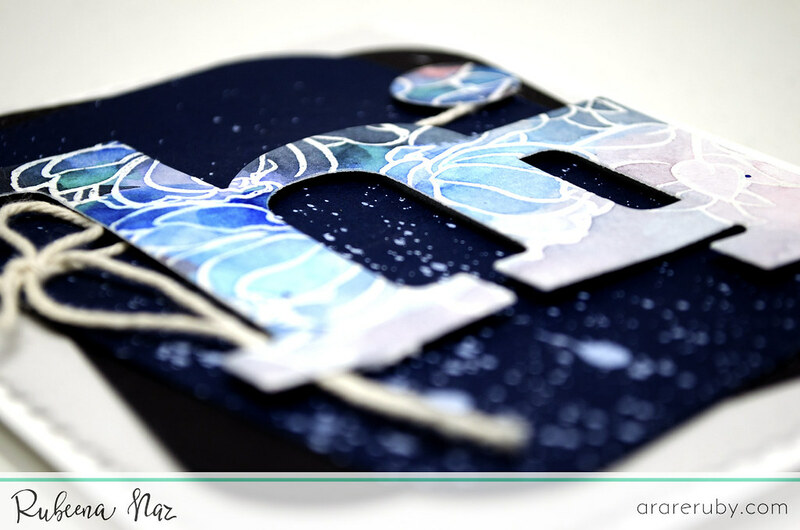 I die-cut some rounded card stock in blue and black and added white pigment splatters. Once it dried, I scored some lines across the center -- inspired by the dress's band. I added twine around the blue piece and glued both pieces over the gray one. Finally, I added the 'hi' cutaway with foam tape. 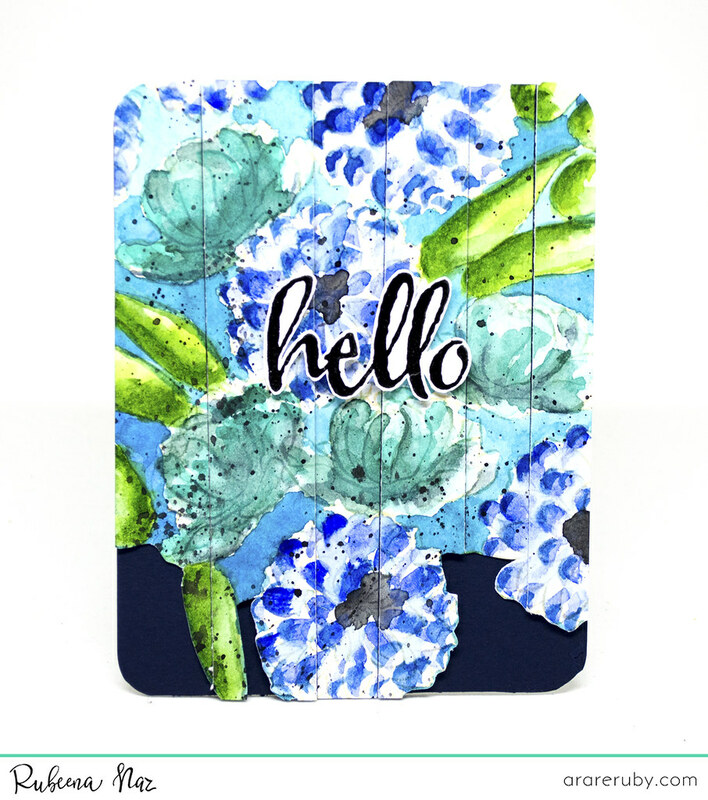 I started by stamping the expressive florals from In Bloom: Lola's Bouquet with Joni Andaya with distress inks using second-generation stamping, which basically means the first stamp is done on scrap paper and then stamped on the main card panel. This way, my card results in some light shades as you can see on the dress. I fussy cut around the top border of the pattern. 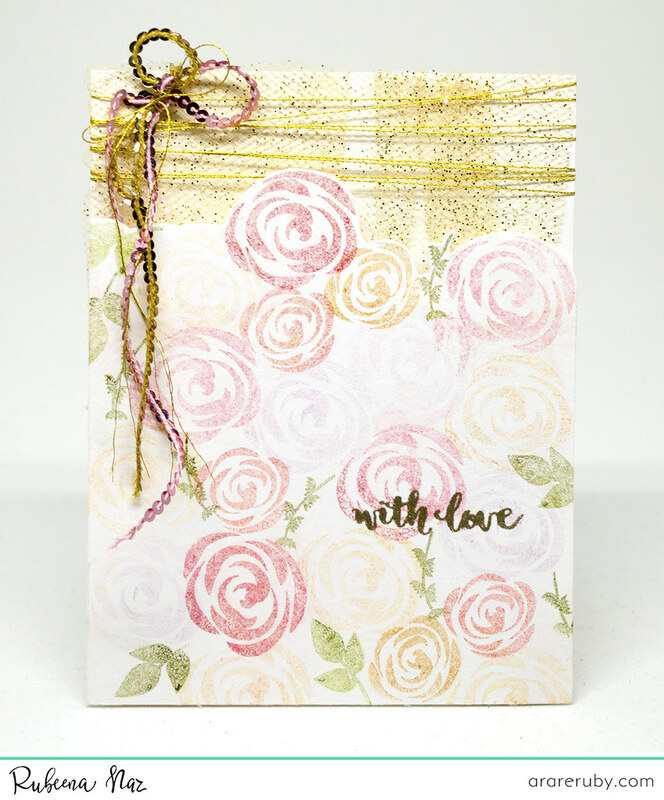 I stamped 'with love' from Happiest of Holidays with Evelin T Designs with VersaMark ink and heat embossed with gold embossing powder. Inspired by the top part of her dress, I used gold glitter tulle. I added foam tape to the stamped panel first so I could glue the gold tulle behind it and have it peeking from behind. 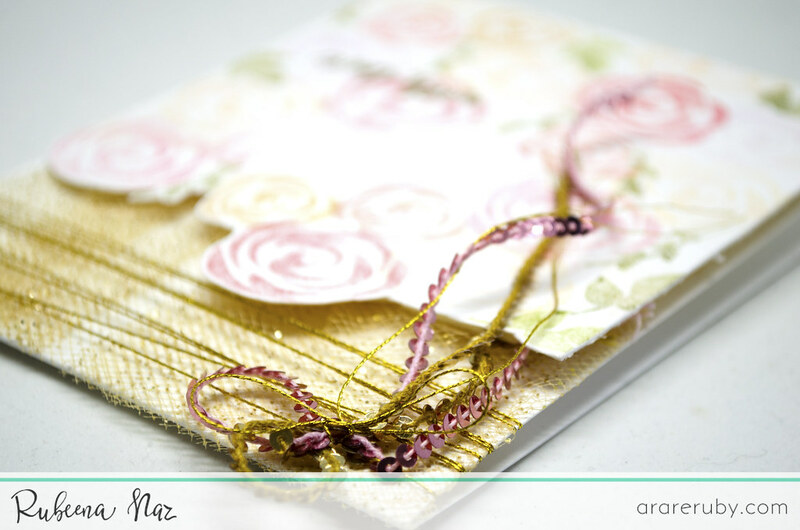 I added some tape behind the gold tulle and glued it to my white A2 card base. I added some multi medium on my card base so the tulle could stick to it, but I also added gold thread over it to secure it. The thread was similar to the lines in her dress. For the final touch, I added gold and pink sequin strands. I totally fell in love with the pattern from this dress. I knew I would be using watercolors so I started with a watercolor panel. I stamped some of the images from In Bloom: Addie's Garden using Antique Linen Distress Ink and then used my Mission Gold watercolors. I added some black splatters once it dried. Inspired by the floral border and the pleats in her dress, I fussy cut around the stems and flowers at the bottom and then cut the panel vertically into 6 parts. I rounded off the corners and placed the panel over blue card stock. I alternated some of the pieces with foam tape. 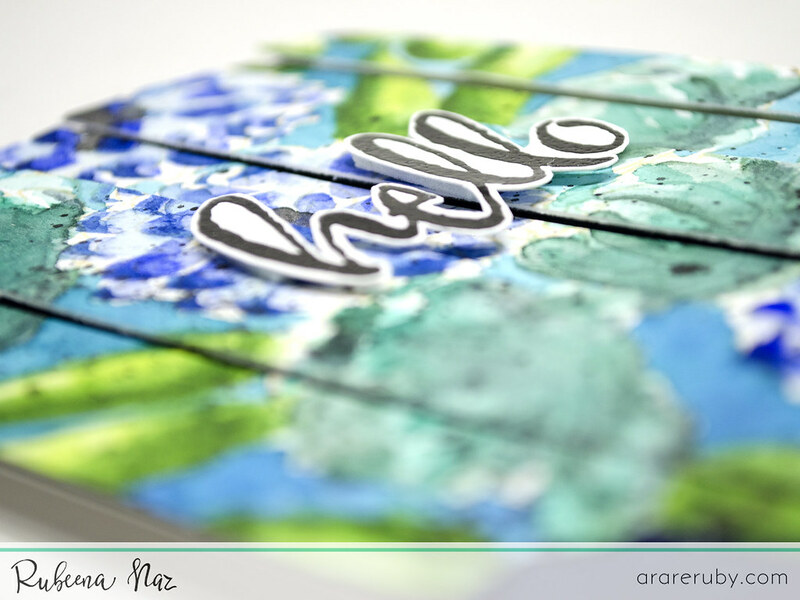 Separately, I stamped 'hello' from The Big, the Bold, and Happy with VersaFine Onyx Black ink and heat embossed with clear embossing powder. I fussy cut it and added it to the center with foam tape. OMG Ruby!! Each of these cards is more gorgeous than the one before it!! I love ALL of them! Wow! All of your cards are gorgeous! 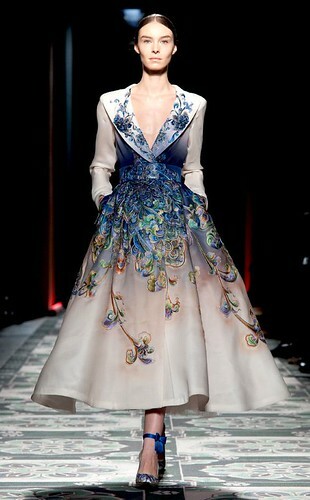 You have such attention to detail, and I love how you incorporated elements of each dress in your creation. Fabulous! Wow! Your talent knows no bounds! These are all stunning!! Breathtakingly gorgeous! You rocked this! Wow, I think this is my favorite post of yours! These are all stunning - and I don't mean the dresses. lol I already knew you were talented, but these cards really showcase your art & talents perfectly. Absolutely gorgeous, all of these. This is a fabulous and fun post! You do florals and fashion so well, Ruby. Gorgeous doesn't even begin to cover it...Your cards are sooo Amazing.. Love love, love the way you have to translated the inspiration into your card design... Just Wowwww!! Oh WOW!! I love how you translated the fashion designs into your beautiful cards!! I have played with this blog a few times and always found it fun but it did not come naturally to me. I LOVE your designs!! Gorgeous cards! I love the see how the inspiration pics have influenced your beautiful cards! Talk about nailing the inspriation photos. The cards are amazingly constructed with all those incredible details drawm from the gowns & dresses. Beautifully incorporated into spectacular cards. All 3 of these are beautiful. Great to see how she was inspired. Ruuuuuuby, these are stunning! I'm with you Jess, you took the words right out of my mouth, lol. I think I just found my new way of looking for inspiration. TFSAAI. Oh my gosh! My mouth is hanging open! these cards are so fabulous! i cant get over it! these are all AMAZING!!! i have to find a way to pin these. drop dead gorgeous! sorry, having trouble typing. way to go, girl!!! you really rocked these! hugs, treen! Wow - just amazing! Love what you did with the inspiratioN!! WOW Ruby, you have been a busy lady. These are all just beautiful. What a pretty cards love them all. Absolutely stunning work! Each one is such a fabulous take on the inspiration photos. Cool - love your inspirations and the cards that emerged from them! What a great way to get inspiration - the dresses are drop dead gorgeous and your cards inspired by them are fantastic Ruby. Love your cards from the inspiration dresses, gorgeous! What beauties! Love how each of the dresses inspired your cards. Amazing work!! 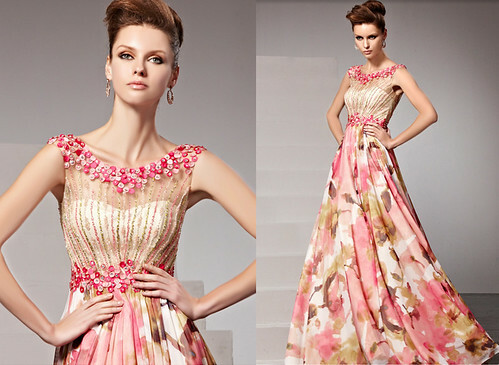 Wow what a stunning collection of cards, I love how you got your inspiration from the different dresses just magic. My favourite would be the 'hi' but not by much. So so clever. Wow all of these are absolutely fabulous and so pretty! Awww! I'm speechless!!!! All of these creations are absolutely stunning! I'm definitely in love for Ruby's work! Love, love, love! WOW!!! 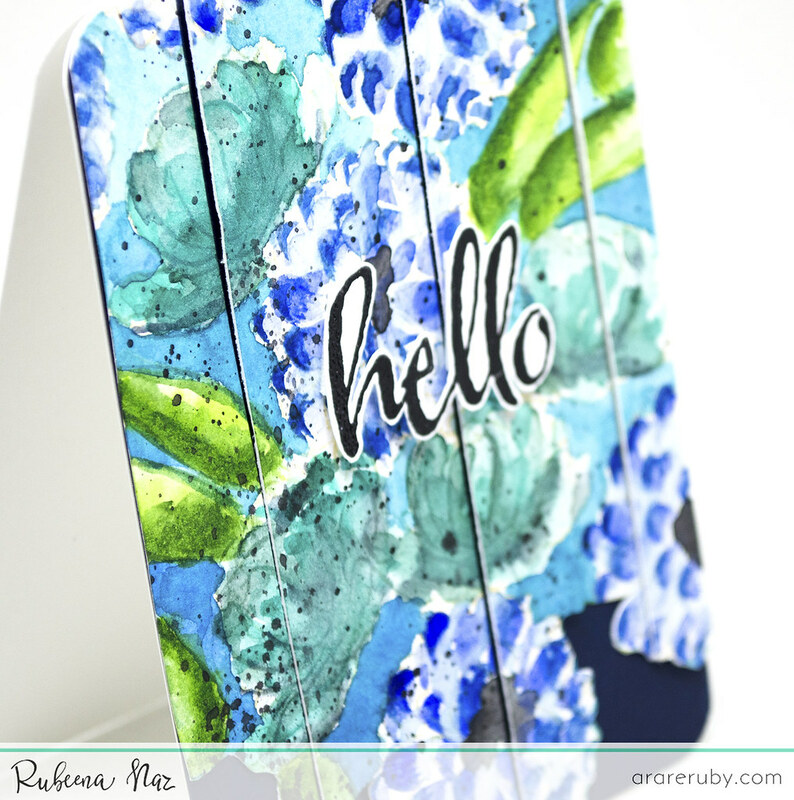 Rubee, those cards are GORGEOUS inspired by those beautiful fashion designs. You rock!! All your cards are gorgeous, but the first and last I really love! The colors are amazing. Oh, my - all four cards are just stunning! Your first card really just blew me away! What an AMAZING final performance, Ruby, LOVE how you were inspired by the fashion photos!! Beautiful cards!! Love how you've used fashion inspiration for the cards!! Very beautiful!! Wow!!Ruby! !all your cards are beautiful and awesome! Wowzers!!! These are incredible! 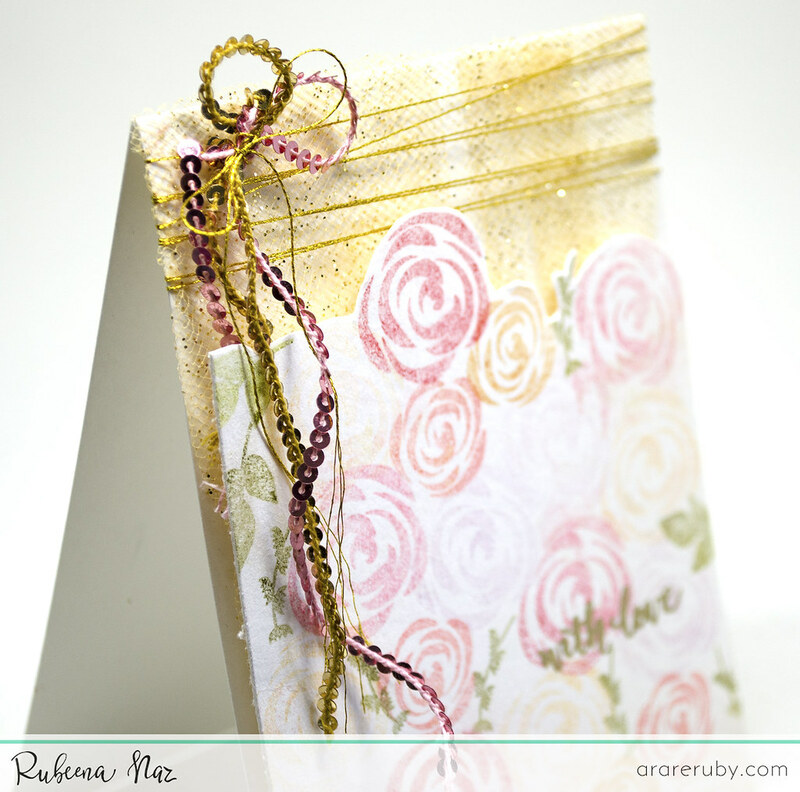 Love your mix of texture with the stamping to mimic the dresses! Love how you used fashion to inspire you. Absolutely gorgeous cards! 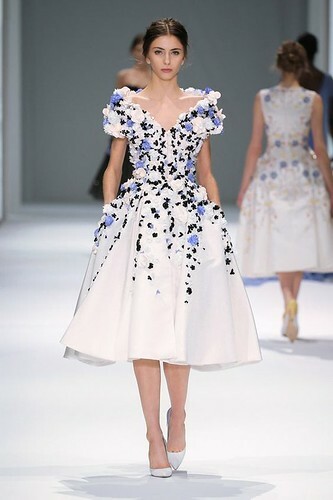 So cool how you found your inspiration through fashion and those beautiful dresses! I confess, I've come to let my eyes savour your inspiration and cards several times before leaving a comment, I am IN AWE of your STUNNING designs and colours - WOW!!! what a fun design inspiration - fashion models. colors and designs from the outfits. I am seriously in awe at the way you took inspiration from the fashion photos and then created knock-out beautiful, amazing cards!! What an inspiration Rubeena is to me!!! Oh wow, stunning work, every piece is a great piece of art! WOW Rubeena! Your cards are absolutely amazing... every single one of them is an inspiring work of art! Btw I miss RIC, my all time favorite challenge. Oh WOW!!! They are simply breathtaking! Each and everyone!!!! Bravo Ruby!!! 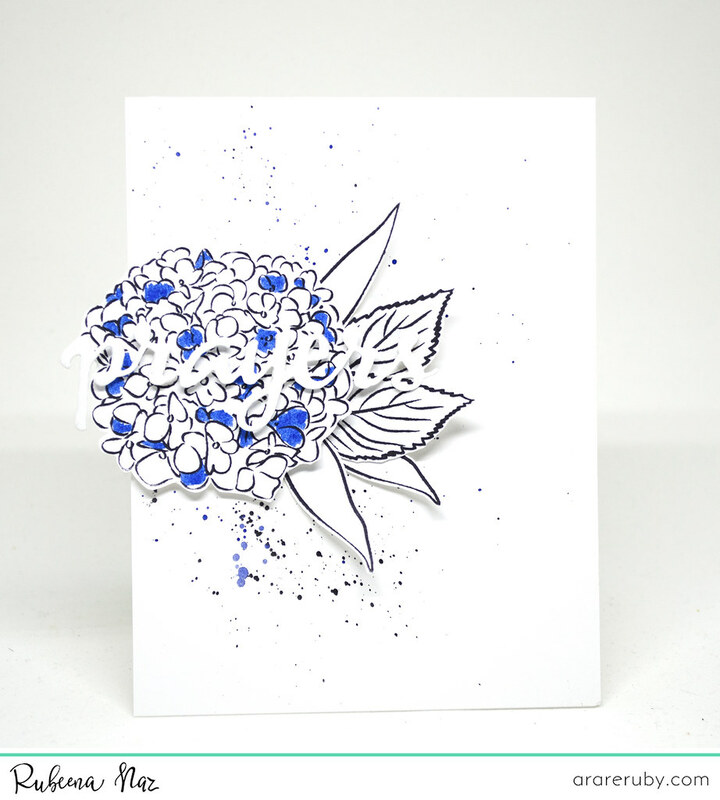 Wow you totally blew me away with this dress inspired cards!